Do you look after your mum, dad, brother, sister, or other relative or friend? This may include helping out at home by cooking, cleaning or doing the shopping. Are they ill or do they have a disability or do they have another health-related problem? All young carers who register with us receive a free copy of our Young Carers Information Guide, and on the left is an image of the guide’s front cover. Give you the opportunity to take part in social and recreational activities. Being a carer means you have a right to help and support. If you are under 18, we will need your parents’ consent to register, please Contact Us. Being a young carer can force you to grow up more quickly than your friends who are the same age as you. You often have much more responsibility such as preparing food, helping to manage medication, even being in charge of the families finance. All of these responsibilities can take its toll and can prevent you from joining in many of the other fun things children your age are doing, such as hanging at a friend’s house or just chilling in your room. Because of this young carers can feel they are not coping well and sad. Our Young Carers Just Talk Service provides a confidential space for you to talk about how you are feeling and provides you with support, tips and solutions to help address or manage your circumstances. You can choose to speak with an experienced counsellor over the phone or meet up with them face to face at a time convenient for you. If you would like to talk to someone please call our confidential line on 020 3802 7079 Monday – Thursday, any other time, just leave a message. Click here to view a copy of our latest Events Programme for Young Carers (up to June 2019). For details of these and other subsequent events you will find details on our Events page. Read a case study about how we helped a young carer in Brent who without our support would not have been able to finish his A Levels. Please Contact Us for further information, including details of forthcoming support activities and events. You may also find helpful some of the information contained in our Downloads for Carers and Downloads for Schools pages. In order for a Young Carer to take part in our fun respite activities and events, we must have a signed consent form from their Parents. Download the Young Carers Consent Form. Please complete and sign the Form and return it to us by post or drop it off at our offices. Another great way to keep in contact with us and other young carers in Brent is via our Young Carers Facebook page, as well as our other Brent CarersFacebook page. You can also follow us on our @BrentCarer Twitter account. 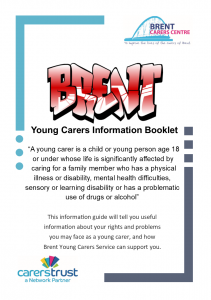 Brent Carers Centre is committed to offering Young Carers the support they need to make life easier for themselves and the person you care for. Please let us know if you think we are doing a good job or if there are areas we can improve – we need your feedback. Please help us by taking a few minutes of your time to answer the questions that come up under the links below. All information provided will be treated in the strictest confidence. In addition to the services offered by Brent Carers Centre here are some other services available provided by national voluntary organisations. The Carers Trust’s handbook Getting into Work: a Guide for Young Adult Carers is an employment guide to help young adult carers who want to get into work.